Part of the Zuni Mountain Range, Oso Ridge is located on the northeastern boundary of the Ramah Navajo Indian Reservation in Western New Mexico, about 30 miles southeast of Grants, and about half way between the El Malpais and El Morro National Monuments. 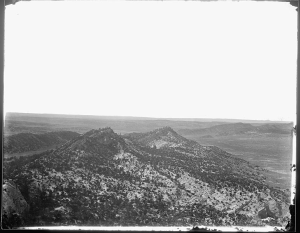 "View of Zuni Mountains, west of Oso Ridge, New Mexico, ca. 1875" by Elias Olcott Beaman, James Fennemore, John K. Hillers is licensed under Public Domain.